The bullet that killed a Trader Joe's store manager in an exchange of gunfire with a homicide suspect following a pursuit crash Saturday was fired by a Los Angeles Police Department officer, police said Tuesday morning. 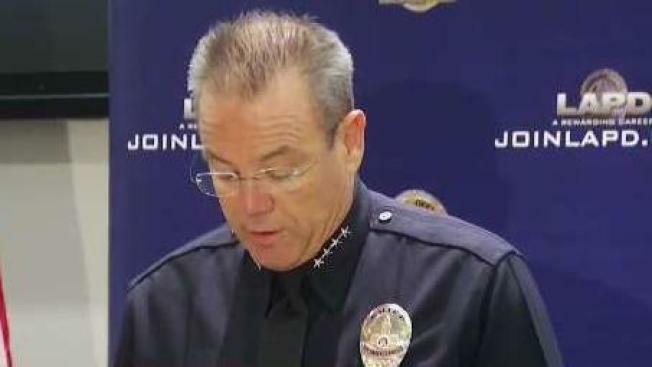 LAPD Chief Michel Moore made what he called a "heart-breaking" announcement during a news conference about the investigation into the deadly standoff at the busy Trader Joe's store in Silver Lake. Moore said the round was fired by one of two officers as the gunman, who was struck by a round in the left arm, ran into the store and opened fire on police. After the pursuit driver crashed into a light pole on Hyperion Avenue, people inside store approached the front windows, Moore said. That's when 27-year-old Melyda Corado was accidentally struck by LAPD gunfire as she tried to leave the building, Moore said. She then went back inside the store and collapsed, police said. The Los Angeles Police Department has released dashcam and body camera footage from the hostage situation at a busy Silver Lake Trader Joe’s. "Those officers' actions to stop him, the split-second decisions they had to make, I recognize how they will forever go through their lives debating whether that was what they had to do," Moore said Tuesday. "I believe it's what they needed to do in order to defend ... the people in that store and to defend themselves. "It is unimaginable, the pain of the Corado family. We share that pain." Corado was eventually carried out by store employees. The officers fired a total of eight rounds, Moore added. Moore said he spoke to the two officers who opened fire outside the store. "I know that it is every officer's worst nightmare, to harm an innocent bystander during a violent engagement," Moore said. "I spoke to both of these officers this morning. They are devastated. They were devastated in the immediate aftermath of this event -- that a person died in their efforts to stop Atkins. This is a heartbreaking reminder of the split-second decisions that officers must make every day. And it is also a sobering reminder of the destruction a lone individual with a handgun can create." The store remained closed Tuesday, but mourners continued to leave flowers and other items at a memorial outside the building in memory of Corado. Mayor Eric Garcetti said he met with the victim's family. "Saturday was a dark day for the family of Melyda Corado, and it is our responsibility to shed light as quickly as possible on what happened," the mayor said in a statement Tuesday. "Melyda's loved ones are entitled to answers — and Angelenos deserve complete transparency in understanding the full circumstances of her death." The news conference comes as criminal charges were filed against the suspect, identified as 28-year-old Gene Evin Atkins. He was charged with one count each of murder; kidnapping; fleeing a pursuing peace officer’s motor vehicle while driving recklessly; grand theft of an automobile; driving or taking a vehicle without consent; discharge of a firearm with gross negligence; shooting at an occupied motor vehicle; and assault with a firearm. He did not fire the fatal round, but Atkins can still face homicide-related charges under California statutes, such as the provocative acts doctrine. Prosecutors said he was charged under the provocative acts doctrine because the suspect's actions set into motion the events that led to the store employee's death. Bond was set at $18 million. Atkins allegedly shot his grandmother and wounded another woman before he crashed his car and ran into the supermarket northeast of downtown Los Angeles, where he held dozens of people hostage in a tense standoff with scores of heavily armed officers outside. Video released at the Tuesday news conference showed video of the pursuit and exchange of gunfire from LAPD body-worn cameras. One of the body-worn cameras shows an officer running for cover behind a concrete block wall. Atkins fired at officers from outside and inside the store, Moore said. No hostages were seriously hurt before the man handcuffed himself and surrendered about three hours after the crash. Atkins' grandmother was in critical condition on Sunday, police said. She was shot seven times at a South Los Angeles home and another woman, who was allegedly forced into a car before the pursuit, suffered a graze wound from a bullet before the crash. Two of Atkins' cousins said he had argued with his grandmother over his girlfriend being in the house. Officers tracked the car using the Lo-Jack stolen-vehicle tracking system and tried to stop the man in Hollywood, but he refused to pull over, police said. He then allegedly fired at officers through the car's rear window. Officers did not return fire during the chase, Moore said. In one of the videos released by the LAPD, an officer can be heard telling a colleague during the pursuit, "Don't shoot." Customers in the store and others in the parking lot sought cover as bullets shattered the store's glass doors. Some people in the store climbed out widows. Other barricaded themselves in rooms.